Back in March we caught our first glimpse of five Robot Masters from Mega Man: Fully Charged, the new animated series hitting Cartoon Network later this year. Most were recognizable, one or two not so much. 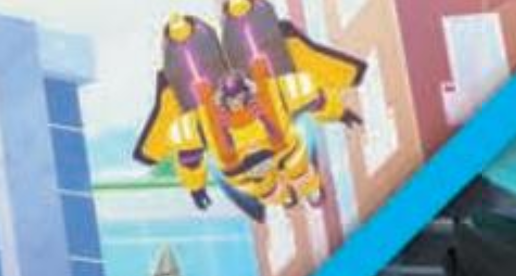 Today we're looking at someone that fits into the latter: a mysterious, yellow fellow rocking some major Starscream vibes. This image comes to us from the latest Licensing Source Book, the very same issue that revealed the show's new subtitle, "Fully Charged". It remains to be seen if this character is a reinterpretation of a classic Robot Master (Gyro Man? Astro Man? Maybe someone from Mega Man 11?) or an original character entirely. My money's on OC – remember, we're to expect quite a few of those. I don't believe we'll be waiting much longer to learn more about this guy. I've spoken with an artist on the series and it sounds like more concrete details about the show are coming this summer, if not sooner. (Licensing Expo starts May 22). My ear will be on the ground. Either he's Duo, or potentially the show's equivalent of Dark Man. And even if he's not Dark Man, they'll probably introduce him in some form or another. Looks like the lamest rendition of Dark Man ever, if that's the case. Yeah, wouldn't be my choice of a design. I'm just calling it based upon the track record of the designs I've seen, almost none of which I've been a fan of. The scowl on my face, right now, would say it all. I mean, if one could see it. Just, suffice to say, I was not expecting straight-up Transformers knock-offs, in a Mega Man-related product. No kidding. I haven't seen anything in this that suggests it'll even live up to the really bad original cartoon at this point. I might give ONE episode a try, but I expect this is an attempt to reboot for young kids of today.. and I think it's going to backfire horribly. the bad original cartoon was still decent enough and at least a respectable interpretation. My guess its Pharaoh Man. His head looks like he wears that pharaoh headress. Ya know what? It's probably High Max, from Mega Man X6. I see Hard Man's head. This show will fail miserable!! Considering it doesn't look like it belongs in a Mega Man game, I don't blame them. Also could you elaborate on the bit in parenthesis? It could very well be a different version of Galaxy Man or Astro Man, what with the shuttle-esque rocket booster lookin' things. And yes, first thing that went through my mind was "They're gonna do it. They're gonna call him Rocket Man. lol"
To get really specific in terms of Transformers, the dude reminds me of this iteration of Astrotrain. He's likely an OC otherwise though. American cartoon is AWFUL AND UGLY! BOOO!!!! JAPAN ROCKS! Japan has some pretty goofy interpretations of American things. Have you ever seen their Teenage Mutant Ninja Turtles cartoon with the mech? either gyro man or an oc imo. Definitely an OC. It's the least ugly design impo.